PC version reviewed. Copy provided by developer. Superhot will immediately grab you by its unique selling point: time only moves forward when you move. When you’re not moving everything grinds to a near halt, moving at a mere fraction of their original speed, effectively recreating that scene from The Matrix. You know the one. It begs to wonder why something with the same feature hasn’t been made before, instead of the relentless use of bullet time found in other games of the genre. Not only does it take this inventive premise, but it also throws in what could be seen as almost prohibitive features by bringing in golden bullet, one shot, smack with a bat or punch, and you die. The same goes for the enemies. The combination of the two makes for one of the more interesting and compelling puzzle or first person shooter games you’re likely to play. Thirty two levels in the main campaign of Superhot will run you through the gamut and challenge you more than most shooters have ever likely done in the past. At the same time, it also sets up sequences that will remind you of some of the most memorable sequences in film history. The corridor from Oldboy? You can bet on it. The Matrix? That’s the whole game. You are the chosen one, someone able to make the correct decision in a split second and overcome overwhelming odds. What makes it all the more entertaining is the base nature of this gameplay and the visuals that directly correlate with it. Enemies are red. Interactive objects, be they guns, melee weapons or random clutter that you can pick up and throw at an enemy are black. Everything else is white. It makes for a simple and visually striking aesthetic that is even better when anything that is killed or destroyed shatters, and scatters, like glass. Following the death of all your enemies in any given level, you get to see the real time footage of your actions. What may have taken you a good few minutes to complete during the games slow motion action will result in a video that may show you throwing a vase to knock an enemy off balance, catching his gun to then shoot three other foes in quick succession, to only then toss the pistol to distract another who you then proceed to knock out with your bare hands. All with nary a second spare. It makes you feel like the coolest person alive. It really helps that the level design is simply phenomenal in its simplicity. Ranging from the aforementioned corridor, to more open areas like an office, or a bar, to the ultimate enclosed area which puts you in an elevator with three enemies, for the door to then open to more. They’re all designed to give you freedom in what you do, and the tools to do what you want. Would that the game stick to simply setting you a challenge in a new setting and let you get on with it. 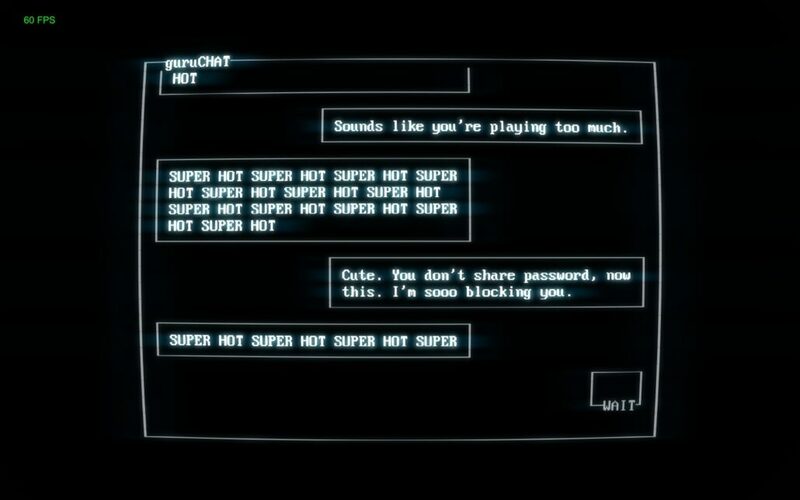 Superhot is another metafictional game along the same lines of Magic Circle, Pony Island or Calendula and for me, the narrative actively takes away from the enjoyment of the game. Particularly so when it actively takes control from you, dictates your next move or worse, tells you what to do but doesn’t let you do it. While others may enjoy the story, as well as the delivery method (through an old DOS screen where you will be messaged by a friend and others, as you progress through the game), I wasn’t particularly fond of it. While some of the events, such as the game forcing you to quit to your very own desktop, to only then reload with a bugged in-game desktop, are compelling, others where control is directly ripped from you in relatively prolonged sequences, where exposition is forced down your throat, can break the groove the game puts you in. Where the meta aspect of Superhot shines is found in the in-game desktop. A link to a chat group which is reasonably believable in the fifteen to twenty minutes of random fluff chat, though also featuring comments to some hidden aspects of the game. You can also find a tree-cutting minigame, a variety of ASCII art, videos using the in-game OS’ limited graphics and a number of other small features. 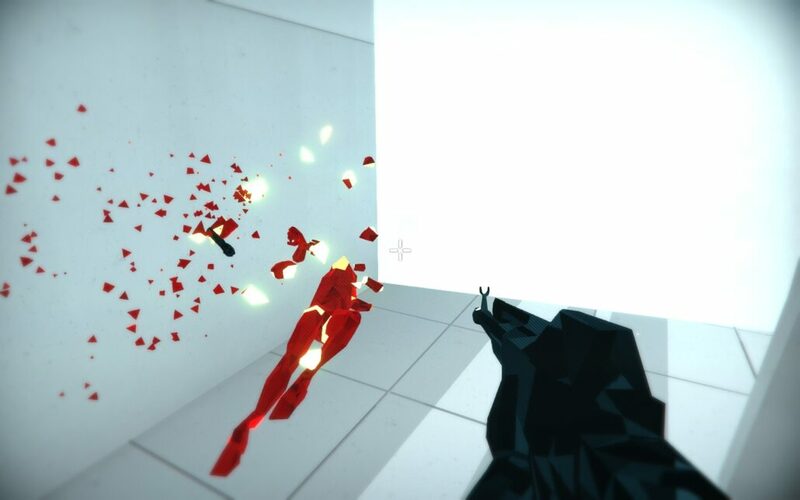 Alongside the fake community offered inside the game, Superhot also comes with its own real community site, Killstagram, which features all of the real time footage that players have uploaded upon completion of a level. It’s a very effective way for anybody to show how cool the end result of Superhot can be, possibly and most likely bringing in more people to the game, though it can also be used to show how silly the game can be. What you take away from Superhot depends on how much you got into the story. It’s not difficult to understand and it’s not exactly bad, I personally just found myself let down by the game starting with a simple aspect of a hacker sending the in-game you a copy of the game, to it then delve into what it did. Particularly when levels popped up that didn’t include the best aspect of the game, killing the red dudes. Superhot is a very demanding game and on numerous occasions outright tells you what to do. The very end tells you to recommend it to others by stating ‘It’s the most innovative shooter I’ve played in years’ and leaves you with numerous options to forward a fixed message stating that. Is it really the most innovative shooter in years? Yes. However, it has a short campaign and the challenge levels may only offer you a limited amount of time after that, only the endless mode will be left to keep you coming back. Superhot initially seems like style over substance and as it develops, it proves that this isn't the case. However, it decides to take substance too far which can actively detract from the game. However, the gameplay, great design and added features more than compensate for any detracting factors. 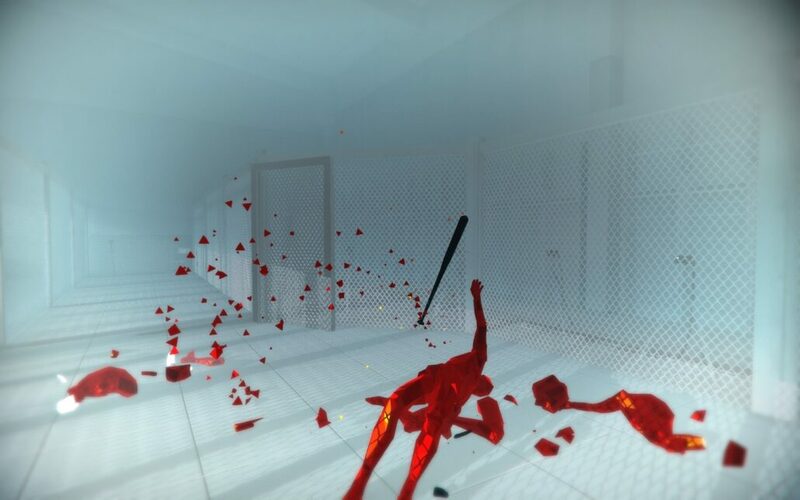 Superhot has a brilliant visual aesthetic which combines perfectly with the core gameplay feature, which is used to brilliant effect both in game and after, when creating some of the best footage you're likely to find from a game. The story behind Superhot is interesting, though at times it takes away by forcing you into events that actively stall the game, detracting from the experience as a whole.